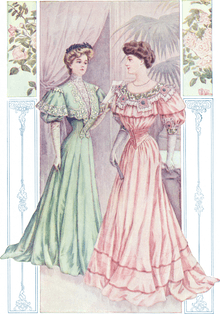 A princess line or princess dress describes a woman's fitted dress or other garment cut in long panels without a horizontal join or separation at the waist. Instead of relying on darts to shape the garment, its fit is achieved with long seams and shaped pattern pieces. A rarely used alternative name for the Princess line was French-dart-line dress, after the specific darts used in its construction. ↑ Ashelford, Jane (2009). The Art of Dress Clothes and Society, 1500-1914. ([New ed.?] ed.). London: Gardners Books. p. 283. ISBN 9781905400799.